26/09/2016 - Switzerland, represented by Ambassador Ulrich Lehner , today deposited its instrument of ratification for the multilateral Convention on Mutual Administrative Assistance in Tax Matters ("the Convention") in the presence of OECD Secretary-General Angel Gurría. 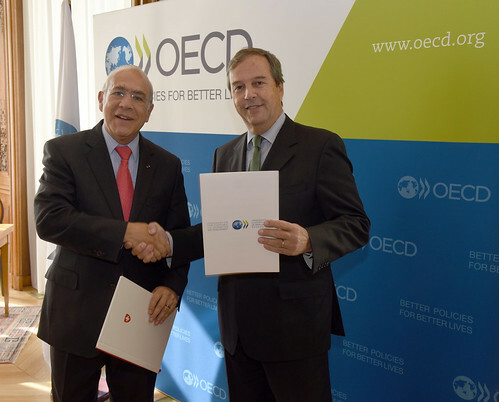 This ratification re-affirms Switzerland's commitment to greater tax transparency and marks another important step in implementing the Standard for Automatic Exchange of Financial Account Information in Tax Matters developed by the OECD and G20 countries as well as the automatic exchange of Country-by-Country Reports under the OECD/G20 Base Erosion and Profit Shifting (BEPS) Project. Switzerland is committed to implement automatic exchange of financial account information in time to commence exchanges in 2018 and is a signatory of the CRS Multilateral Competent Authority Agreement (the "CRS MCAA") and the Multilateral Competent Authority Agreement on the Exchange of Country-by-Country Reports (the "CbC MCAA"), which are both based on Article 6 of the Convention.